The Peppered Catfish, Corydoras paleatus is also called Peppered Cory, Peppered Corydoras, and Peppered Cory Cat. This peaceful fish is a harmless scavenger. The only fish it eats are ones already dead. It is an omnivore and will eat most types of food. By nature it is a bottom feeding fish but it will eat at the surface at times. This fish comes from the warmer parts of South America. The Peppered Catfish is not very fussy about its water chemistry. I would suggest a Ph of 7 (Neutral), definitely avoiding extremes of acidity or alkalinity. The hardness of the water does not seem to matter to this versatile fish. A clean tank is definitely better than a dirty one. Make sure the water you use for your fish has had the Chlorine or Chloramine removed before it is added to the aquarium with your fish. 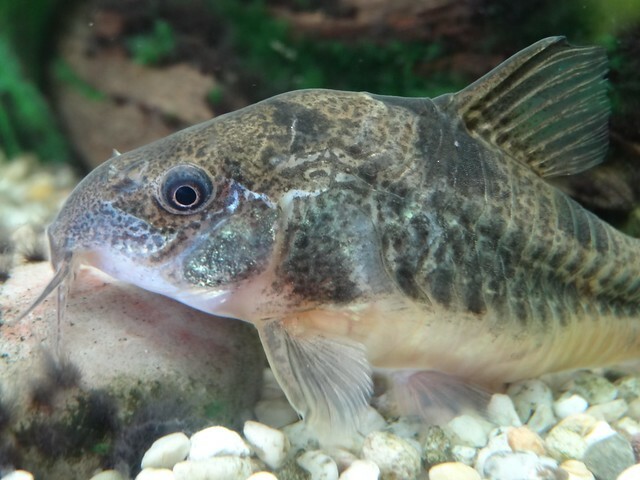 Like many Corydoras Catfish, the Peppered Catfish can swallow air and extract the oxygen with its intestines. It is normal to occasionally see a Corydoras Catfish suddenly shoot to the surface where it presumably takes a quick gulp of air, and returning to the bottom. If it does this a lot, it can be an indication of something wrong, such as the aquarium being short of Oxygen. The Peppered Catfish can be kept without others of its kind, but does interact if given a chance. Some people recommend six in a tank together, but this would only be practical in a larger tank. There are many other fish which are suitable companions for this catfish. I would avoid extremely aggressive fish and very large ones, but most common aquarium fish should be all right. This includes all the Tetras, nearly all the Barbs, Danios, White Clouds, peaceful dwarf cichlids, Angel Fish, Discus, Fighting Fish, Australian Rainbow Fish, other Corydoras Catfish, most loaches and Goldfish. Apart from its interest and beauty in its own right the Peppered Catfish is often kept as a scavenger. It is one of the fish that can be used as a scavenger in either tropical or coldwater aquariums (As long as they are not too cold!) They will eat uneaten food on the bottom, but not fish waste. Also, it is always important not to overfeed your fish, even with an efficient scavenger in the tank. They are not specialized for eating algae and do not do the job of an algae eating fish like a Bristle nose catfish. Peppered Catfish are sometimes stimulated to spawn by a drop in temperature. It has been reported that a simultaneous drop in barometric pressure helps. It is a good idea to condition the potential breeders with meaty foods including things like Earthworms, Tubifex Worms or Daphnia. One male and one female is the minimum requirement for breeding. They are not communal breeders requiring a school to breed, but some people prefer two or three males for one female. The female will clean surfaces such as a section of the aquarium glass or a leaf of a plant. The male may rub against the female's head. She will lay her eggs into a basket made with her fins, and the male will fertilize them. The female will attach the eggs to places she has cleaned. After a while the process is repeated and continues until the female has laid all her eggs. This can be over two hundred. The eggs should hatch in about six days. Well fed Peppered Catfish do not usually eat their babies. At first the babies will eat mainly the protozoan organisms in the tank, but will soon be able to eat fry foods.